Shopify partnered with same-day delivery service Postmates to help merchantsspeed up the shipping process. Shopify's integration with Postmates is initially live in more than 200 cities across the United States. After the integration has been activated, local customers can select Postmates at the checkout as their delivery method. Then, merchants simply pack the order and request a pick up to have a Postmates carrier take the order where it needs to go. It is also important to note that both the merchant and customers can track orders from pickup to drop off. While merchants are able to track the order in real-time from Shopify, customers are emailed a link to a Postmates live map where they can also keep track. 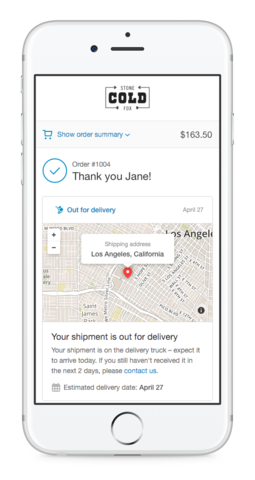 Shopify merchants in any of the covered cities can set up same-day delivery via Postmates by enabling it in their shipping settings. From there, merchants simply need to fill in their contact details, hours of operation and special delivery instructions.